The founder of the Humanitarian UAV Network shares how drones are helping communities around the world respond to disasters. Drones, or Unmanned Aerial Vehicles (UAVs), are already being used in humanitarian response around the world. An unprecedented number of small and lightweight UAVs were launched in the Philippines after Typhoon Haiyan in 2013. They were used in Haiti following Hurricane Sandy in 2012. And more recently, they were flown in response to the massive flooding in the Balkans and after the earthquake in China. This increasing use of UAVs for humanitarian purposes explains why the United Nations (UN) recently published an official policy brief on the topic. And, a number of UN groups like the Office for the Coordination of Humanitarian Affairs (OCHA) are actively exploring the use of UAVs for disaster response. These organizations have also joined the Humanitarian UAV Network (UAViators), which I founded, to promote the safe and responsible use of UAVs in humanitarian settings. The view from above is key for humanitarian response, which explains why satellite imagery has played a pivotal role in relief operations for almost two decades now. But satellites do present a number of limitations including cost, data sharing restrictions, cloud cover, and the time needed to acquire images. In contrast, UAVs can capture aerial imagery at a far higher resolution, more quickly and at much lower cost. And unlike satellites, members of the public can actually own UAVs. This means that disaster-affected communities can launch their own UAVs in response to a crisis. This grassroots approach is important for community resilience and disaster response. 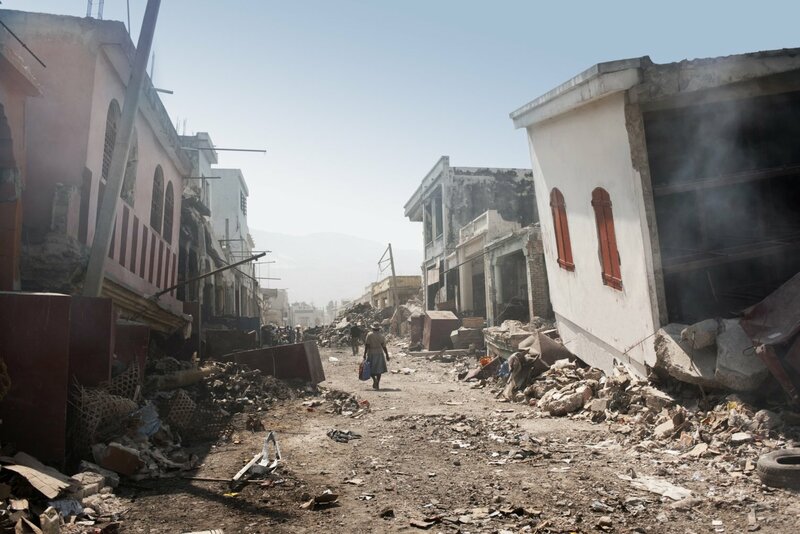 Groups like SkyEye in the Philippines and CartONG in Haiti are actively training local communities to operate their own UAVs for disaster-preparedness purposes. Here at UAViators, we’re strong proponents of community-centered approaches to humanitarian UAVs. To be sure, community engagement is key when it comes to the ethical and responsible use of UAVs for disaster response, and sharing aerial imagery with local stakeholders is very important. During their humanitarian UAV mission to the Philippines, Drone Adventures printed their very high-resolution aerial imagery at a local banner shop. The result, as shown in the picture below, is a rollable, waterproof banner that can be used by local stakeholders for subsequent community mapping projects. To capture these and other best practices, UAViators drafted a Code of conduct & operational check-list, which is an ongoing community-driven initiative. We also launched a crowdsourced crisis map of aerial videos of disaster areas to demonstrate that an informed public can be important part of the solution. Like social media generated during disasters, these videos can provide humanitarian organizations with important information on infrastructure damage and resulting needs. Of course, like social media, there are obviously risks in using UAVs for disaster response. But this is precisely why UAViators has drafted the checklist, to provide guidance on do’s and don’ts. Risks cannot be eliminated, but one way they can be better managed is through education and awareness raising. The crowd can also play an important role in making sense of aerial imagery during disasters. Take MicroMappers, for example. This joint initiative with the UN has developed an app called the “Aerial Clicker” to crowdsource the analysis of aerial imagery for disaster response. Since testing new technologies in the middle of a disaster can pose important challenges, MicroMappers has partnered with Kizukis Wildlife Reserve in Namibia to crowdsource the search for animals instead. The goal of this pilot project is to support Namibia’s wildlife protection efforts while improving the Aerial Clicker for future disaster response projects. Anyone can join these efforts; no prior experience is necessary to become a digital ranger or a digital humanitarian. So small and lightweight UAVs are already being used in disaster response; currently to capture high-resolution imagery but soon for micro-transportation too. So the question is no longer if, but rather how. How do we ensure that these promising technologies continue to have positive impact in humanitarian settings? How do we ensure that local communities have a say in how UAVs are used? In addition to these questions, there are growing concerns around safety, privacy, regulation and ethics that need to be tackled earlier rather than later. One way to address these challenges is by mobilizing a community of practice that can pro-actively discuss these issues. This fall, we’re co-organizing an Experts Meeting on Humanitarian UAVs to be held at UN Headquarters as a first step. We look forward to progressing the effective and ethical use of humanitarian UAVs. – Patrick Meier is the author of the forthcoming book Digital Humanitarians and founder of the Humanitarian UAV Network (UAViators).